Hi all! Can you believe it's the beginning of a new week already? Is it just me or do the weekends disappear in a flash? Well, I got some major non-crafty things done this weekend- cleaned out my closets and drawers of all clothes that no longer fit (I've been getting healthier and its starting to show!) and took them to donate. Then tried to find a few cute things to replace my now mostly empty closet :) Had a fabulous Father's Day- my sister and I treated the dad's to dinner on us and it was full of good food and lots of laughter. I did have some time for crafting though and it's a good thing because CHA is coming quickly and I'm going to be there this year with Some Odd Girl- yay!!! But before that happens there are still a ton of fun things going on at SOG- one of which is a new clear release this week. I'm pretty sure you're going to love them; I know I sure do! To start off we're revealing Dare To Be Gwen- you might remember I had a sneak peek of her all the way back in April- but now she's finally here. 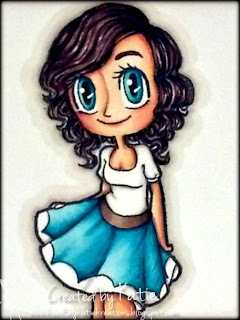 I absolutely love coloring her up and she's perfect for just about any type of card. Because of that I left this particular one without a sentiment so that I can customize it once I know what it will be used for. I hope that you like my card- make sure to hop on over to the SOG blog to see some more amazing creations featuring Dare To Be Gwen by my fellow teamies :) And keep a look out because I'll be back Wednesday with a look at one of the other awesome images being released! Thanks for stopping by! Adorable frame!! Great layers too!! I really enjoyed coloring her up, she is so versatile! Awesome work!!! 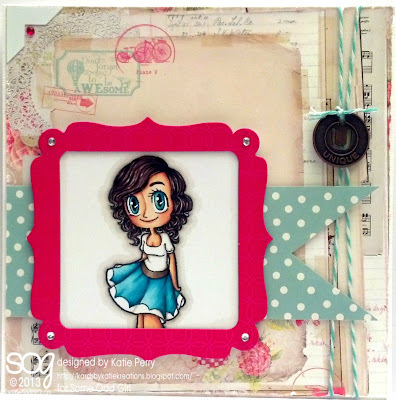 Beautiful card and I love the blue skirt - the frame is a great touch! Another beautiful card Katie!! I'm loving her dark hair. I've just stumbled across your blog and I am soo pleased I did, it has made my morning. Your work is beautiful and you have really made me giggle so thank you for sharing! Love this card layout and how you framed the image. Plus I do love fishtails! YOU'RE GOING TO CHA?!! CRAP! I was going but then had to cancel because other things go in the way. DAMMIT!! Can you go again next year? LOL!! I think I'm going to try to get to the winter one in Feb or end of Jan. Something like that. Dang that would have been so cool to have met you! Check out the Little Darlings when you're there. She'll have some of my stuff there. hee hee!! So glad you get to go. COOL!! Oh and great coloring and image BTW...LOL!! Hugs! Your cards are always beautiful. You put them together wonderfully. It's always fun to visit your blog, Katie!! So much inspiration here! !